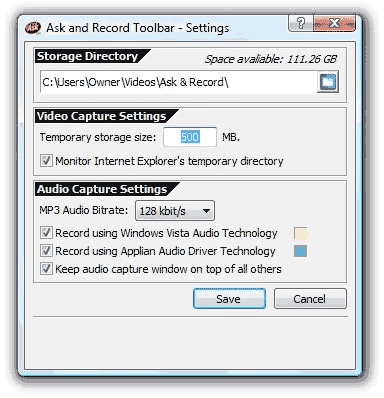 Often we watch a video or listen a beautiful song in web browser and end thinking “… wish I could download and save this video or song on my computer!” Well, this is possible for any video you watch or any song you listen in web browser using “Ask and Record Toolbar”. It is a free web browser toolbar that allows you to download any video or audio played in the browser. After you have watched a video (meaning: it has fully streamed), just click “Save video” button to download that video on the computer. Similarly, you can download any audio played in browser by clicking “Record Audio” button. You can click settings button to mention folder where all downloaded audio – video content will be stored. You can also specific other settings like maximum storage size for videos, MP3 bitrate etc. 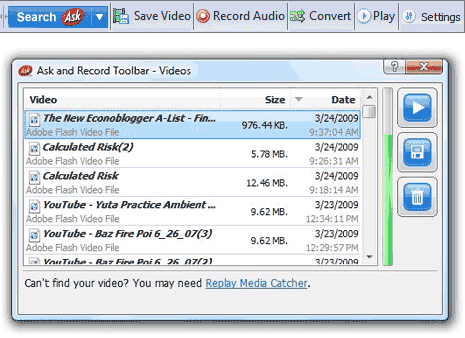 Besides download audio – video content, you can also use this toolbar to convert downloaded content in desired media format. Download Free Ask and Records toolbar, it even allows you to search ask.com – just incase! Split Firefox Browser Window, Interested ?